Published by: Hot Key Books. Official synopsis: "Roberta 'Bobbie' Rowe is not the kind of person who believes in ghosts. A Halloween dare at her ridiculously spooky boarding school is no big deal, especially when her best friend Naya and cute local boy Caine agree to join in too. They are ordered to summon the legendary ghost of 'Bloody Mary': say her name five times in front of a candlelit mirror, and she shall appear...But, surprise surprise, nothing happens. Or does it? Next morning, Bobbie finds a message on her bathroom mirror...five days...but what does it mean? And who left it there? Things get increasingly weird and more terrifying for Bobbie and Naya, until it becomes all too clear that Bloody Mary was indeed called from the afterlife that night, and she is definitely not a friendly ghost. Bobbie, Naya and Caine are now in a race against time before their five days are up and Mary comes for them, as she has come for countless others before...This is a truly spine-chilling yet witty horror from shortlisted 'Queen of Teen' author James Dawson." I'm not going to lie, I am a bit of a wuss, a scaredy-cat and am definitely not a fan of anything that I know is going to scare the living daylights out of me. But when one of your favourite authors does a take on the chilling urban legend of Bloody Mary, you can't really pass it up, now can you? 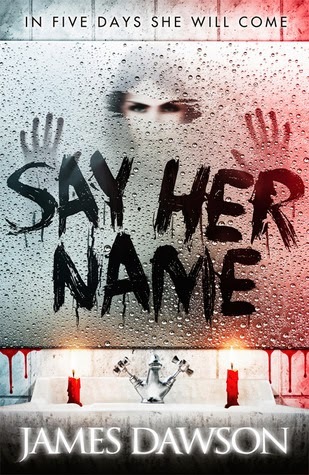 I picked up my proof copy of Say Her Name gingerly as if my touch would be enough to wake her and bring her knocking at my own mirror wanting to haunt me and started to read and I was sucked straight into the story. When Bobbie and her friends decide to "summon" Mary on Halloween, no less, they think nothing of it. It's just a simple Halloween prank, just a bit of fun, a laugh to pass another night at Piper's Hall school for girls. But as they stand before the mirror, Bobbie sees something flicker in the depths of their reflection, but surely it's just a trick of the light, right? Wrong. Before long strange things start happening to Bobbie, Naya and the swoon-worthy Caine. All three of them dared to call her name five times, "Bloody Mary, Bloody Mary, Bloody Mary, Bloody Mary..." I'm stopping at four.., and awaken something they could never of dreamed off. Soon, it becomes a race against time as they only have five days to find out what it is that Mary wants. Honestly, some scenes in this book were so scary, so chilling, that at times I actually put the book down and had to walk away. I had to. One night I was reading it and it was dark outside, thanks to working full time I can normally only read in the evenings, and I was freaking out. I can't look in a mirror again the same way that I did before. If I have to go to the bathroom at night I avert my gaze away from the reflective surface to the left of me and pretend it isn't there, that I can't see Mary there in the reflection, just waiting to take me next. Thanks James! As with James' previous books, Hollow Pike and Cruel Summer, Say Her Name is wonderfully written and immersive. And even though you're having the living daylights scared out of you at times, the book demands you keep reading - you almost get the feeling that if you don't, Mary will reach a cold hand out of the pages and drag you in herself! It has it's funny moments too, moments that had me laughing, moments that lured me into a false sense of security for the darkness to come. And as well as that it has sad moments, moments that make your heart break a little for Mary herself as you start to learn her origin, why she does what she does. I have to say I loved the ending, as well. There are several twists that happen in quick succession that had me gasping, only beginning to recover before gasping again and shaking my head in amazement and disbelief that I hadn't seen any of it coming. Such is the masterful way that James tells the story. Fantastic. To sum up, I cannot recommend Say Her Name enough. Even if you are a bit like me, as easy to scare, just try and read past it. That's what I did and I thoroughly enjoyed myself. It is a fantastic read that you will not regret picking up! And check out that cover! It's so beautiful that you can't pass it up!! Thank you to Hot Key Books for being so generous to send me a proof copy! Truly appreciate it! And thanks to James for the pre-order swag! Superfans REPRESENT!